Home Music Paul Snider looks to the landfill for The Music of Junk! Paul Snider looks to the landfill for The Music of Junk! Ballagpipe. Grumpet. Saxcycle. Glube. 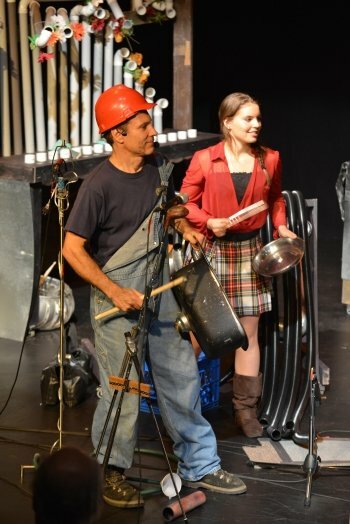 They may sound like something out of a Dr. Seuss book, but in reality they are four of the instruments created by Vancouver musician Paul Snider for the upcoming production of The Music of Junk! Everything in the landfill has a history, and I decided to build stories and songs around the life that these instruments had. – Paul Snider, creator of The Music of Junk! 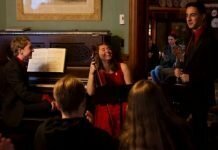 Originally seen on stage at the 2014 Vancouver Fringe Festival, The Music of Junk! has evolved from a piece of musical theatre into the current version that highlights both the instruments and the stories that the items he uses to create his instruments can tell. Since the Fringe, Snider has used the additional time to create the show that he had originally envisioned. In addition to creating The Music of Junk!, Paul Snider also conducts and performs a number of his musical creations in the show. Photo by André Lanz. Along with the larger instruments, Snider now features twenty instruments in the show, from a collection of over thirty. And while it may sound like the inspiration for each instrument comes solely from the junk he uses to create them, the reality is quite a bit different. In keeping with his recycle and reuse message that remains at the core of The Music of Junk!, Snider also looks for items that have a specific story to tell, like the slide guitar created from a child’s sled given to him by a friend. The Music of Junk! plays The Waterfront Theatre (1412 Cartwright Street Granville Island) November 18-22. Visit http://themusicofjunk.com for tickets and information.